Shown L-R: Producer Jimmy Jam; President/CEO of The Recording Academy®, Neil Portnow; honoree Jimmy Iovine; and Producers & Engineers Wing® Senior Executive Director Maureen Droney, at the P&E Wing Event at The Village Recording Studios on February 8, 2012, in Los Angeles, California. Photo courtesy of The Recording Academy/WireImage.com/Michael Kovac. Photographed by Michael Kovac. © 2012. 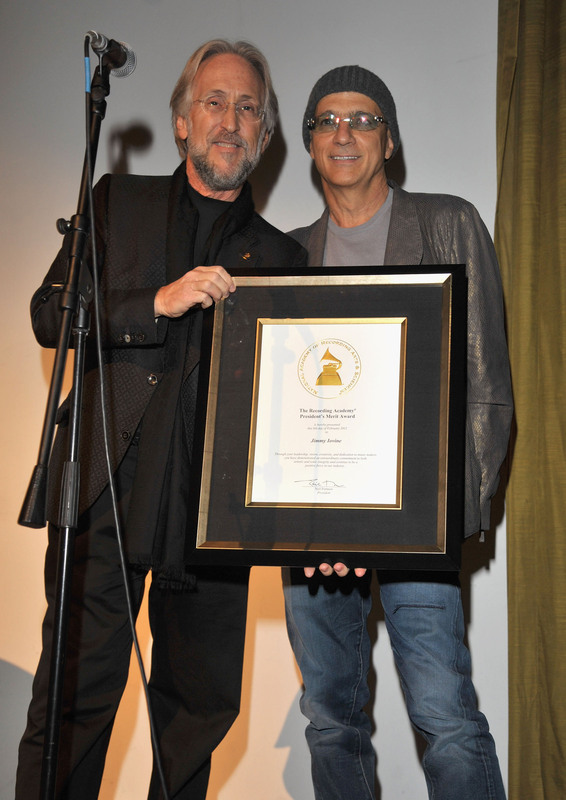 Shown L-R: President/CEO of The Recording Academy® Neil Portnow and honoree Jimmy Iovine, posing onstage during The 54th Annual GRAMMY® Awards P&E Wing Event at The Village Recording Studios on February 8, 2012, in Los Angeles, California. Photo courtesy of The Recording Academy/WireImage.com/Lester Cohen. Photographed by Lester Cohen. © 2012. SANTA MONICA, Calif. (February 14, 2012) — In what has become a much-anticipated evening that kicks off music's biggest week ahead of the annual GRAMMY Awards®, Wednesday, February 8, 2012, saw the fifth annual GRAMMY® Week event held by The Recording Academy®'s Producers & Engineers Wing®. The event, which took place at The Village Studios in West Los Angeles, brings to center stage the irreplaceable contributions made by the recording engineers and record producers whose technical expertise and brilliance warrant GRAMMY Awards of their own. Created specifically to honor individuals who, in the words of Recording Academy President Neil Portnow, have "championed creative freedom" throughout their career, the event has previously honored T-Bone Burnett, Island Records' Chris Blackwell, and five individuals associated with Atlantic Records: Tom Dowd, Ahmet and Nesuhi Ertegun, Arif Mardin and Jerry Wexler. This year’s Producers & Engineers Wing event, which preceded the 54th Annual GRAMMY Awards on Sunday, Feb. 12, 2012, airing live on the CBS Television Network, singled out music producer and entrepreneur Jimmy Iovine, engineer and producer for artists including Bruce Springsteen, Patti Smith, U2, the Pretenders, Dire Straits, Stevie Nicks, Tom Petty & the Heartbreakers and many more. Portnow presented The Recording Academy President's Merit Award to Iovine in front of a star-studded audience that included such individuals as Alex da Kid, Mary J. Blige, Colbie Caillat, Diddy, Simon Fuller, Brian Grazer, Dave Koz, Nigel Lithgow, Stevie Nicks, Robbie Robertson, and will.i.am and Taboo from the Black Eyed Peas. After musical performances by singer/songwriter and "I Love The Way You Lie" co-writer Skylar Grey and singer/songwriter Lana Del Rey, Iovine arrived onstage to receive The Recording Academy President's Merit Award from Portnow. By that time, the crowd was charged, applauding Iovine both for his contributions to record making and for his entrepreneurship. Iovine founded Interscope Records, one of the most successful labels in the world, and more recently he established Beats Electronics, his consumer headphone venture with colleague Dr. Dre, one of many GRAMMY Award winners in the audience that night. Iovine singled out many people to honor with a personal note of thanks, including Stevie Nicks (whom he praised for her unique vocal style), Elliot Scheiner – the first producer Iovine ever worked with and whom he credits for giving him the studio bug ("He wore boots and a leather jacket with a matching leather bag, and at the end of the night he went home with a beautiful woman and I said, 'That's what I want!" Iovine recalled to the delight of the crowd) – as well as engineer Roy Cicala, label head and producer Doug Morris, the late studio owner Eddie Germano and artists such as Mary J. Blige and Tom Petty. Even as he celebrated his current role as chairman of Interscope Geffen A&M Records, a unit of Universal Music Group, and his 20 years as a label head, Iovine credited others for guiding him and for teaching him to give that back throughout his career. He noted, "People were constantly giving me opportunities I wasn't really ready for," but that prompted him to rise to meet those challenges and do the same for several generations of artists, producers and engineers over more than four decades. Iovine also praised the pro audio manufacturing community for its contributions, and indeed The Village was filled with technology demonstrations from sponsors West L.A. Music and Westlake Professional Sales, as well as co-sponsors including Harman International brands AKG Acoustics, JBL, and Lexicon; Iron Mountain; Avid; Musician's Institute; Music Marketing; Shure Incorporated; Beats Electronics; Ultimate Ears; Focusrite Novation; Prism Media Products; Apogee Electronics Corporation; Full Sail University; Guitar Center Professional (GC Pro); Lurssen Mastering; Sennheiser Electronic Corporation; SoundExchange. Eco-friendly cocktails were provided by VeeV. Looking over the crowd of audio professionals gathered at The Village that evening, Maureen Droney, Senior Executive Director of the P&E Wing, observed, "Each year, we take a night to honor the people who work behind the scenes to make great-sounding recordings. You are the glue, the foundation that holds the music business together. Day after day, you are the problem solvers, and the creatives who help others to shine. This is your night to shine. It has been challenging in recent times to keep commercial studios in operation and to maintain a focus on the importance of creating music that sonically reflects the artist's intention. Thanks to the dedication and outspokenness of Jimmy Iovine and others like him, that trend is starting to change. The public is beginning to realize that the sound of the music they are listening to is not as good as it can be and they are starting to demand better. Producers and engineers deserve recognition for being in the forefront of the quest for better sound." 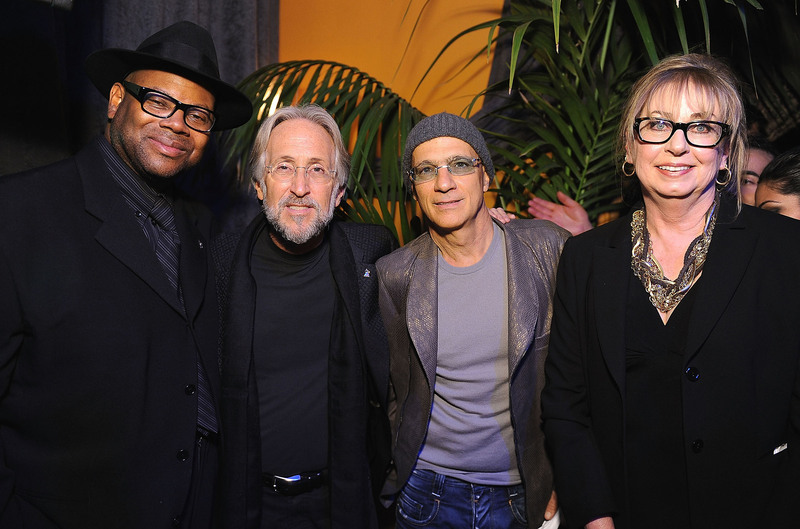 Photo Caption 1: Shown L-R: Producer Jimmy Jam; President/CEO of The Recording Academy®, Neil Portnow; honoree Jimmy Iovine; and Producers & Engineers Wing® Senior Executive Director Maureen Droney, at the P&E Wing Event at The Village Recording Studios on February 8, 2012, in Los Angeles, California. Photo courtesy of The Recording Academy/WireImage.com/Michael Kovac. Photographed by Michael Kovac. © 2012. Photo Caption 2: Shown L-R: President/CEO of The Recording Academy® Neil Portnow and honoree Jimmy Iovine, posing onstage during The 54th Annual GRAMMY® Awards P&E Wing Event at The Village Recording Studios on February 8, 2012, in Los Angeles, California. Photo courtesy of The Recording Academy/WireImage.com/Lester Cohen. Photographed by Lester Cohen. © 2012.